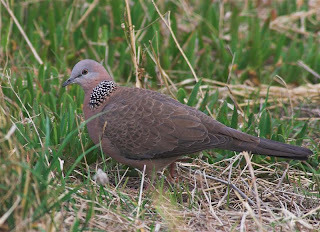 When I came to Launceston in 2002 the only turtle doves were seen in Invermay on the east side of the Tamar River. About 5 years later I 'spotted' a turtle dove in Riverside on the west side of the river and then began to see one or two regularly. About 2 years later I walked out of my backdoor one morning and a turtle dove flew passed me. My home is in Riverside Nth about 3kms further down the river from where i first saw the doves in Riverside proper. The next year a pair landed in the garden and used the birdbath. They seem to be hanging around so i put out some birdseed and they have remained here ever since. The only other place I have seen turtles doves is in Legana - a further 5ks down the river where a group has developed in a light industrial area which now has a grain distribution facility.